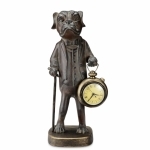 Dog - Bulldog Gifts - Click on an item for more details! This beautiful Dachshund Wine Holder is hand made from the finest poly resin. Then it is meticulously hand painted with stunning detail. So realistic it almost appears that you can see the Dachshund Breath!